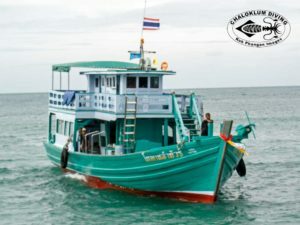 Well, it was meant to be a quick visit to a new boatyard in Suratthani, but Lek and Nick ended up spending 2 weeks there as a great team of craftsmen did a lot of necessary and thoroughly professional work. For sure, after all that it’s great to be back on Koh Phangan and a fine feeling to have the Chaloklum Diving boat looking so good. All we need is a little more SCUBA diving action – things are still quiet in the Gulf of Thailand, although the upcoming full moon party should make the island busier soon. At the dive centre we’re taking it slowly: Michael is moving into dive equipment specialist mode, starting with the tanks visual inspections as Nick grumbles over the monthly accounts and starts on the process of computerising them – moving into the 21st century at last! Michi and the Jan had quite a busy start to the month with a bunch of German Open Water Diver courses and PADI continuing education, so it’s hammock time for some and a visa run to Vientiane for others. And cheerio to the mighty Heinz, Mr Fred and Alex returning to the delights of a late European autumn. Fine SCUBA Diving & Snorkelling at Full Moon Party time on Koh Phangan!